Tonight’s 12 Monkeys, “Fatherland,”Â had a reveal about Cassie and Deacon, and featured a fairly important guest starring role for sci-fi stalwart Matt Frewer. When I chatted with Amanda Schull and Aaron Stanford, I got their take on the episode. 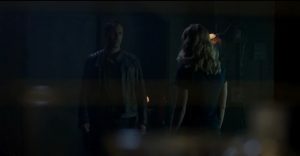 Before tonight’s splinter, Deacon comes to see Cassie off and reveals that he knew who she was when she got there in 2043 because he’d watched her on TV as a boy when the plague hit and she was the CDC poster child. Out of the blue, she takes him down a peg or two on his special moment by telling him that their night together was just that–one night. We’d thought there was maybe something there, but this was the first concrete confirmation. Suits is back in production now, as well, but Schull hasn’t been booked to return yet as Katrina. “Aaron Korsh knows that I am always willing,Â happy, and available to jump back into Suitsville,” she says. 12 Monkeys airs Mondays at 9/8c on Syfy. Murder in the First airs Sundays at 10/9c on TNT.